This guest post was written by Brendan DeMelle, crossposted from DeSmogBlog. Climate skeptics are once again proven wrong, and this time even Koch money can't skew the facts. Have you heard the one from climate deniers that the “Urban Heat Island” effect has ruined all the weather stations and made the data they collect completely useless? 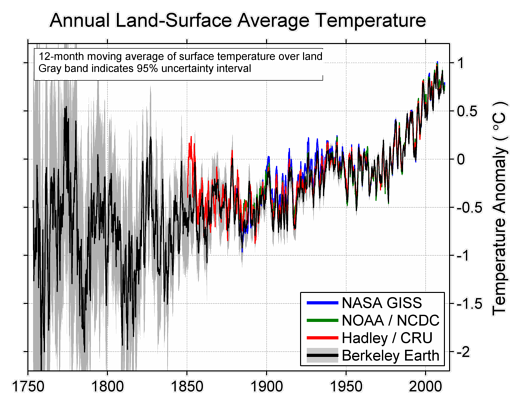 The deniers claim any warming trend seen from these temperature recordings is from concrete buildings and asphalt roads – and that climate change is therefore a myth? That would be false. Says whom, you ask? How about a new Koch-funded scientific study? An investigation by the Berkeley Earth Surface Temperature (BEST) project released yesterday once again thoroughly dispatches the skeptic myth about the “Urban Heat Island” (UHI) effect. To put it plainly, even the Kochtopus denial machine will have a tough time trying to twist this Koch-funded project’s findings. It looks like the Kochs backed the wrong horse here - one wonders whether they thought Hadley CRU would be proven wrong? Mr. Watts isn’t quitting his fight just yet, complaining yesterday on his blog that the BEST studies must first clear peer review. Fair enough, sir, but in the meantime you might want to sharpen your flatware in preparation to dine on crow. This is the same Anthony Watts who published a paper with Joe D’Aleo titled “Is The US Temperature Record Reliable?” two full years before he published the associated peer reviewed paper. Oh, and the peer-reviewed paper came to the opposite conclusion of the Heartland paper. And the BEST papers? Pre-release versions of the papers they’ll be submitting shortly for peer-review at real scientific journals. The Watts/D’Aleo paper? Published by the climate disruption denying Heartland Institute. Watts has so much invested in the US surface station temperature record being wrong that he can’t seem to admit that his own research proved it was right, never mind accept that anyone else’s analyses might show the same. Watts is by no means alone in embracing the Urban Heat Island theory to downplay global warming science. John Christy, Roy Spencer, S. Fred Singer, Tim Ball and his “Friends of Science”, Ross McKitrick and Pat Michaels - to name a few - have all been proponents of the Urban Heat Island theory to explain away global warming data. Many of them excitedly praised the BEST study when it was first announced, apparently confident that it would confirm their theory. They should also sharpen their flatware for a feast of crow and humble pie. It now appears that the BEST effort confirms again what the, ahem, best climate scientists have told us repeatedly in the peer-reviewed science published on this issue over the past 20 years - that UHI is negligible and certainly doesn’t skew the conclusion that surface temperatures are rising. In fact, a 2010 study indicated that stations identified by Watts and others as exaggerating warming actually indicated a cooling trend on closer examination. Oops. Yes, the favorite arguments from skeptics griping about temperature station quality, selection bias and data correction all appear to be falling apart, thanks in part to $150,000 of their sugar daddy Charles Koch’s coin, no less. Remember Climategate? Recall how Phil Jones was dragged through the mud chiefly due to the allegation that his landmark 1990 study on UHI - later cited by the International Panel on Climate Change – was allegedly plagued by flawed temperature data? As it turns out, Jones and his colleagues at the Hadley Centre, who compile the HadCRU global temperature record are enjoying yet another exoneration today, since BEST data confirms the premise that the Urban Heat Island effect is not responsible for the extent of recorded global temperature rises. But there’s little cause for celebration. What the BEST papers clearly confirm (once again) is that global warming is real, and temperatures are rising quickly. “When we began our study, we felt that skeptics had raised legitimate issues, and we didn’t know what we’d find. Our results turned out to be close to those published by prior groups. We think that means that those groups had truly been very careful in their work, despite their inability to convince some skeptics of that. They managed to avoid bias in their data selection, homogenization and other corrections. The hardened deniers will surely find something else to complain about now, as their attempts to paint man-made climate change as a myth grown increasingly desperate. But anyone who could be described as a “reasonable skeptic” must recognize this plain fact and stop misleading the public on this issue. To do otherwise is dishonest and frankly unethical. For more of Greenpeace's work on being transparency to the climate denial machine, check out ExxonSecrets and our ongoing case studies of Koch Industries.